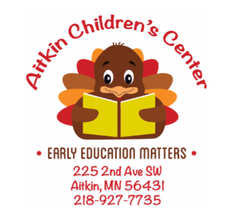 Aitkin Children's Center offers free visits made by an Early Childhood teacher to licensed child care sites in the Aitkin area. Visits are designed for children 3-5 years of age and may include music, guided "read alouds", crafts, and other group activities. Licensed childcare providers may call The Aitkin Children's Center, 218-927-7735, to learn more.